Why we should read, write, and create together--as if our humanity depended on it. You value creativity. How do I know? Call it a hunch. This intuition I have after chatting with you at the book club...Or behind the scenes when we talk about the kind of writing you want to do. Or when we talk about what you're searching for when you read. There's something I've been meaning to bring up with you for a while. Something humble and quiet that I'm offering up today. This question that's been on my mind of late. Yours too maybe. What if THE problem of our time is a crisis of creativity? Think about it. When faced with today’s challenges, how many times do we see the same fearful reactions, watch our societies reach for thoughtless solutions or frame problems without even pausing to understand them fully? If you watch the news once in a while, I bet you can think of some examples. If you’ve stopped watching--well, it may be because of what I’ve just mentioned. All of this makes me wonder--is watching and reacting enough? Maybe it’s time to become the kind of people who take time to sit with a problem, who are willing to think past the first solutions that come to mind. Who know how to reach out to others and create something new. Maybe the times simply demand our creativity--and its twin sister: meaning. Creativity and your quest for meaning. Here I am, going out on a limb and saying you’re on a quest for meaning. Is that presumptuous? I know so many people who are searching for meaning. If you hang around here, there’s a good chance you’re one of them. Truth be told, lately, I’ve had this little voice in the back of my mind. Whispering something faint and simple. What if meaning is not something you seek and find but something you create? What if it’s something we create together? The creative act of reading. What are these adventures of the written word that we undertake? A chance to create something new--an opportunity to collaborate with the author, to tell a story together and to weave meaning from words. Here is a passage that moved me--where Wolfe compares writing by Proust and painting by Monet--works where the artists hint at what they’re trying to capture without giving us all the details, calling on us to participate in the creative process. Of course, the creativity of reading doesn’t stop at the collaboration between the reader, the writer, and the story. When you discuss a story with others, you partake in the creation of something new. You find yourself with something that exists because you engaged in the creative act of spending time with others who are also making meaning out of those words. Writing is just the logical next step. Have you ever seen this TED Talk by Author Andrew Solomon? It's the kind of thing I love to revisit. Watch it (or re-watch it) on a day when you’re not sure how to react to the world around you. On a day when you need to step back and start the creative process of taking the cards you were dealt and, rather than accepting them, turning them into a new form of art. 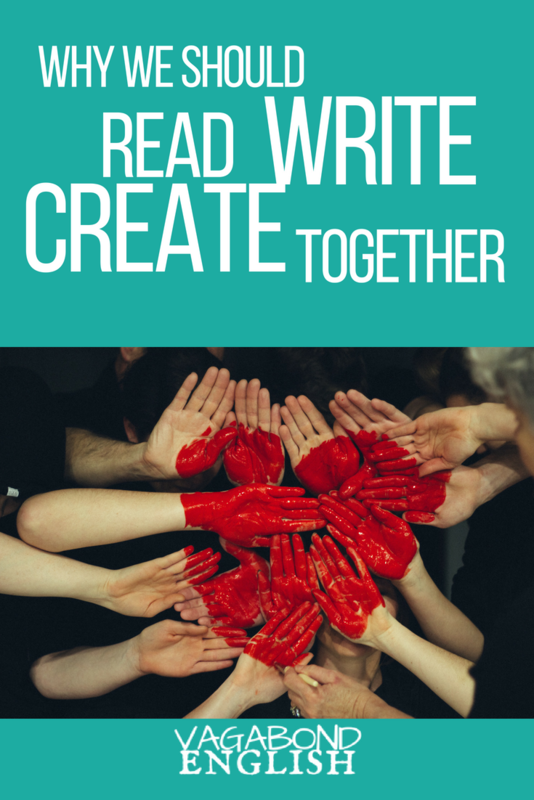 If you're lucky enough to participate in a community where writing, stories and ideas are exchanged--where writers and readers overlap and meet, then congratulations--you've found a wonderful chance to create meaning with others. If you prefer to write on your own and let your reader construct her own meaning, I understand too. And if you're a little afraid to start. Well, join the club. Want a chance to read short bursts of fiction and write a story of your own? A story inspired by your life? Want an invitation to a small community of readers and writers--the chance to create meaning together? Sign up for the Short Story Series. Who are you to tell a story? Who are you to create meaning? Are you thinking that creating meaning is somehow only for prize-winning authors, the Andrew Solomons among us? The people who write best-sellers and turn the world on its head? Can I ask you to rethink that idea? Or at least to hold it out and examine it. Because, at heart, I don’t think we create to become successful--or because we think we’re brilliant. We create because it’s how we find meaning, because we can't help it, because we’re human. And if you’re already engaging in the creative act of reading. The creative act of writing is just the flip side of the coin. And here’s my conviction: the world would be a better place if we took creating seriously. If more people read, if more people told their stories. If we seized the opportunities we have to create meaning--together. Once again this isn’t something I can support with research or authority. It’s something I hold in my heart and am sharing with you. Thanks for being part of this community of thinkers, creators and co-conspirators. Older PostVagabond English Literary Edition--and Celebration!